Beaches of Mexico can be divided into three main areas: the Caribbean coast in the south-east, the Gulf of Mexico to the east and the Pacific Ocean to the west. Riviera Maya is a Caribbean paradise with white sand and turquoise warm water, coral reefs, tropical fish and numerous tourists. The Pacific coast offers kilometers of beaches along the ocean, often empty and battered by waves and currents, which are more suitable for surfing and scuba diving. The Gulf of Mexico is still largely unknown to tourism. 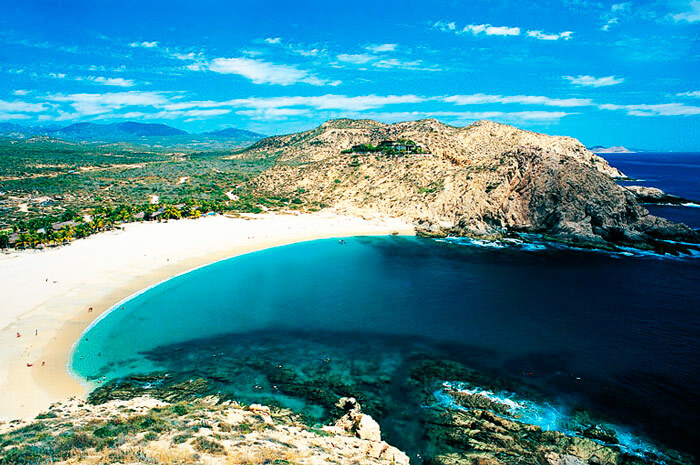 Baja California — a long peninsula that by the Pacific Ocean in the north-western Mexico. Here you can find a wide choice of beaches. Beaches in the eastern and southern bays are safer and more conducive to swimming. Among them is Santa Maria, located at the southern tip of the peninsula, near the town of Cabo San Lucas. Ideal for families with children, for swimming and snorkeling. The beach is not accessible as it is located in a marine reserve and has a well-preserved environment, in spite of the mass tourism.